We have re-invented the fifth wheel! Nothing like the Americana Sequoyah model fifth wheel has ever cruised the roads of America, or the roads of any other country for that matter. 40 years of fifth wheel experience has resulted in patented and patent pending innovations in comfort and performance unheard of until the development of the Sequoyah model fifth wheel. And we can build one just for you! Our Sequoyah (the Cherokee Chief, not the tree) custom fifthwheels are built one at a time to your exact specifications at our shop in Southern California. Each detail is carefully thought out and applied to our exacting specifications. Our custom Sequoyahs include patented and patent pending design features that you will find nowhere else. 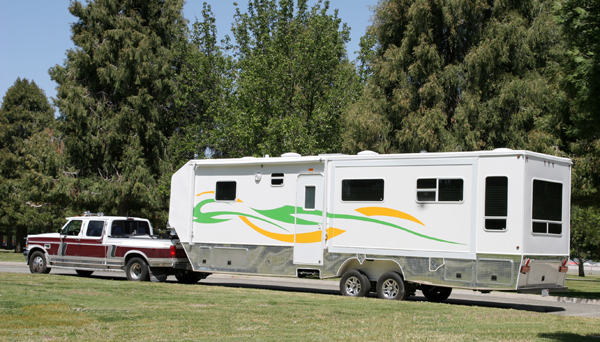 Owning a Sequoyah custom fifth wheel is surprisingly affordable compared to other high-line fifthwheels on the market. None of those mass produced fifth wheels include the innovations available only from Americana, and ofcourse aren't made personally, just for you. The fifthwheel shown here is only 34 feet, yet includes more storage space than any other fifthwheel its size, a full size stand up shower, a bonus room, a stand-up bedroom with a full size queen bed, and a huge uncluttered basement. Not only is the interior space maximized, so is the Sequoyah's performance and durability. Because of high demand for a small, light, easy to tow, eco-friendly fifthwheel, the Sequoyah is also available in a pre-designed 20 foot long version, the Travel Bug. You've never seen a fifthwheel like the Travel Bug, designed from the ground up to be the most eco-friendly fifthwheel ever made, and the easiest to tow. Despite it's diminutive size, the Travel Bug (T. Bug, as we affectionately call it) seems to magically expand to a full size fifthwheel the minute you step into it. T. Bug is the fithwheel of tomorrow, and it's here today! Because T. Bugs are not built one at a time (not on an assembly line) our production is limited to 4 per month. Call or e-mail right away to reserve your production slot today.